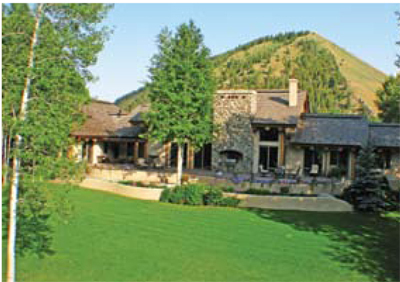 This spacious estate bordering the Wood River has evolved from the original ranch homestead. The Carters, longtime valley residents, loving turned the original homestead house into a charming two bedroom guest cottage. After finishing the guest cottage, they turned to building a spacious mountain style home with a focus on entertaining family and friends. As you walk through the massive carved front doors, you enter the spacious great room with expansive views of the patio, large landscaped yard and the Wood River. The great room has a stone fireplace, media wall, spacious dining area, gourmet kitchen, bar area and powder room. The living and dining areas open directly onto the paver patio. The use of log accents, stone and tile create a casual yet elegant feeling to the exterior and interior of the home. The gourmet kitchen is a chef’s dream with top of the line appliances, granite counters and large work spaces. There is also a complete and separate catering kitchen and an outdoor cooking and dining area. Whether summer or winter, the home is perfect for dinners for family and friends or for the large parties that the Carters host for many charity events. The main floor master suite has it all – river views, bedroom and bath fireplaces, his and hers baths, dressing areas and walk in closets, steam shower, jetted soaking tub, exercise area and an outdoor hot tub on a private patio. On the opposite side of the home there is a main floor guest suite that opens onto the patio and yard.. Upstairs there is a third bedroom suite with balcony views up the East Fork canyon. The home also has an office with a fireplace and sitting area. In addition there is a large loft game room with pool table and darts that overlooks the living area. All the main floor rooms easily flow out on to the patios, landscaped yard and numerous flower gardens that blend into the natural areas that border the Wood River. The 2 bedroom, 2 bath guest cottage has an open living, dining and kitchen. The master suite and guest bedroom are upstairs. The cottage has it own 2 car garage and a bonus room and extensive storage in the basement. Listen to the sounds of the river and view the varied wildlife as you relax on the spacious patios or stroll through the landscaped and natural areas on this large and private 3 acre estate. 3 1/2 baths, main floor master with his & her baths, a main kitchen, a catering kitchen, and an outdoor cookery on a large heated patio, game room for billiards and darts, large office with custom cabinetry and fireplace. Guest cottage – 1200 sqft with 2 bedrooms, 2 baths, plus a 700 sq ft downstairs bonus room. Garages for 4 cars or many toys.